Come enjoy sanibel living at its best with this 4 bedroom, 3 bath direct gulf access home with boat dock and lift. Featuring over 3300 square feet of living area this spacious home exudes tropical elegance nestled against a spectacular coastal backdrop with unbroken panoramic views of the canal. Western exposure showcases magical sunsets nightly. To enhance your indoor/outdoor living a new heated and caged pool with large sun shelf and shaded lounging area was just added and offers abundant room for entertaining friends and family. Elegant two story great room with fireplace and wood plank ceiling is graced by wall to wall sliders allowing gentle sea breezes and natural light to flow throughout. Recently updated chef's kitchen flows into a large dining area with sliders that open to an oversized deck perfect for the growing family. Master bedroom is conveniently located on the main living level and features plantation shutters, a large en suite bathroom and walk in closet. Three bedrooms, all with their own balconies are on the third floor allowing privacy and unparalleled views for your guests. This waterfront home has it all! 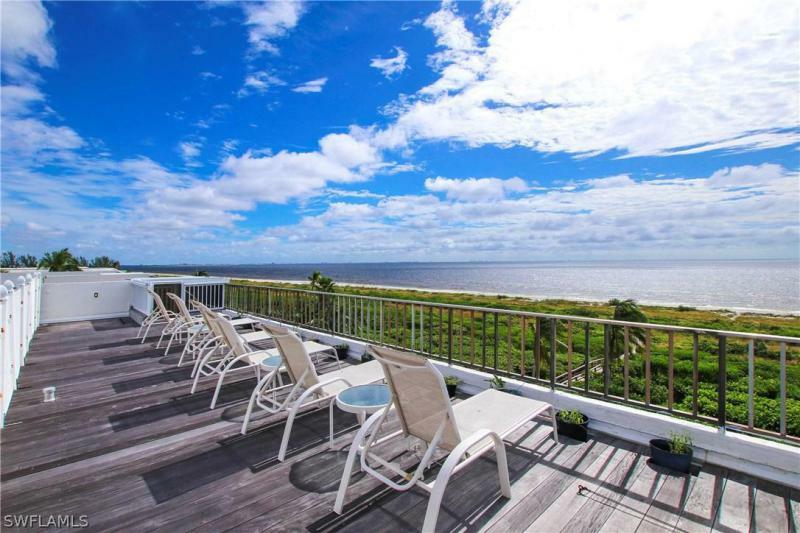 This exquisite 3000+ sf penthouse condo is located directly on the gulf of mexico with dramatic panoramic views. In addition to the living space of three spacious bedroom suites plus a den and three baths, this apartment boasts a private rooftop deck and a ground level 425 sf cabana! The kitchen is intended to delight any chef and also offers lovely waterfront views from the unique dining area seating eight comfortably. The upscale furnishings, appliances and cabinetry invite welcoming gatherings and comradery to visiting family and guests. 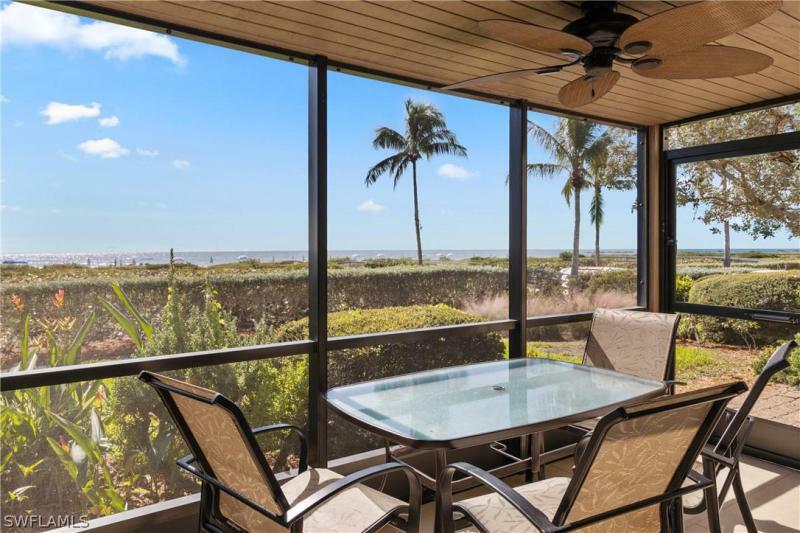 The large lanai is a relaxing escape offering an extension of the living room and providing serenity with the sea and commanding views of the spectacular waters of the gulf. 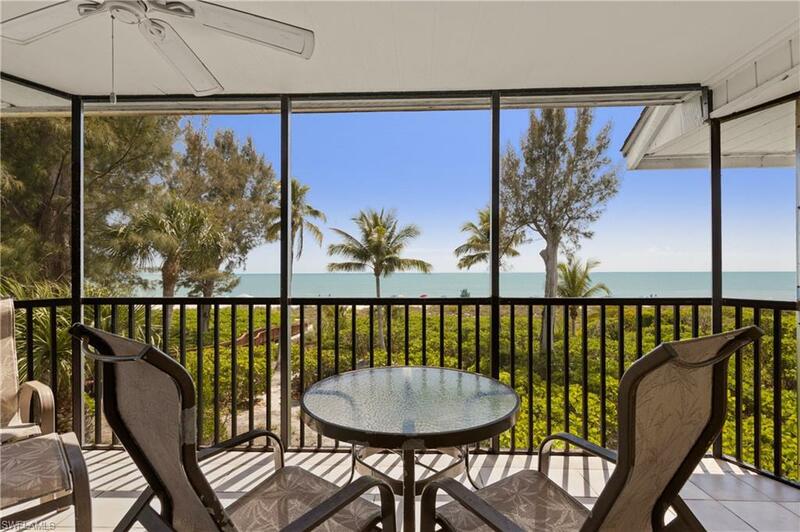 This custom appointed condo has impact glass windows and doors and under-building parking; the privacy offered by this eleven unit compound includes beautifully landscaped gardens/grounds a large heated swimming pool, tennis court and gulf beach walk-over. Conveniently located on the lighthouse end of sanibel, proximity to the mainland is an added dimension to this island location. Rare opportunity to own one of only a few remaining beachfront parcels on sanibel island. Enjoy the soothing sounds of lapping waves, warm trade winds off the gulf of mexico and spectacular sunset skies awash with color nightly. 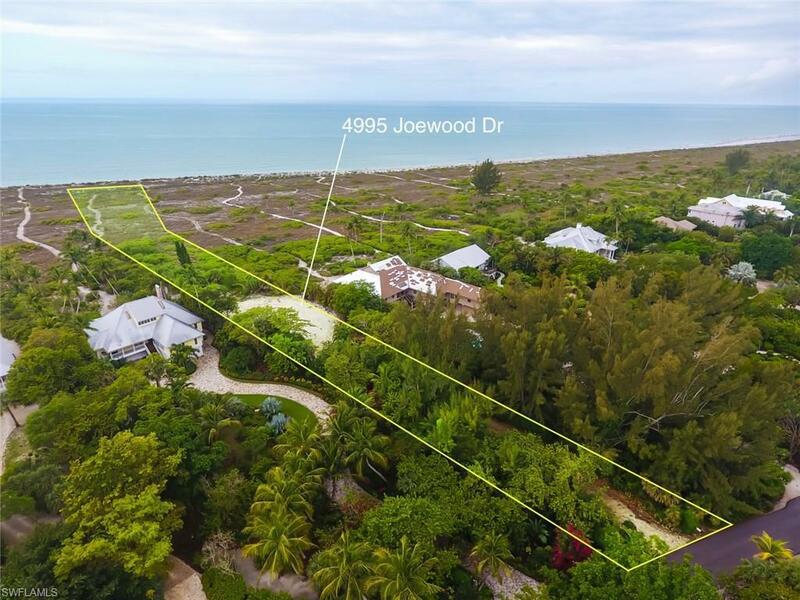 With just over an acre, this large parcel of land has room to build a beautiful tropical home and pool with panoramic views of the shimmering waters of the gulf. Sanibels west end offers quiet, private uncrowded beaches, incredible shelling, abundant nature and stunning sunsets. Experience the charm of this property and make 4767 tradewinds drive your new address. Offering a location and view that are second to none, this top floor corner unit is built right on the coastal construction control line so it is set forward of most of the surrounding buildings and has 180-degree panoramic views of the gulf and beach, including long views looking down the beach from the corner lanai and side windows. The vaulted ceilings and clerestory windows add a feeling of spaciousness to the unit. Remodeled and refurnished by the current owners after their purchase, the unit is designed in an understated beach style that is timeless as it is attractive. Features include spacious open concept kitchen, tongue and groove wood ceiling accented with decorative cross beams, all new master bath with redesigned layout, impact windows for storm protection, and plantation shutters. As a top floor end unit, you only have one neighbor, so you enjoy privacy that is uncommon for most rental condos. Pine cove is a weekly rental condo community on the west end of sanibel near tarpon bay road, conveniently located within biking distance to baileys grocery and many restaurants/shops. Comm amenities: large pool with spa, grilling & picnic area & boardwalk to the beach. As large as many of the residences on the island, this spacious walkout condo lives like a home with the carefree convenience and ease of ownership that condo living provides. 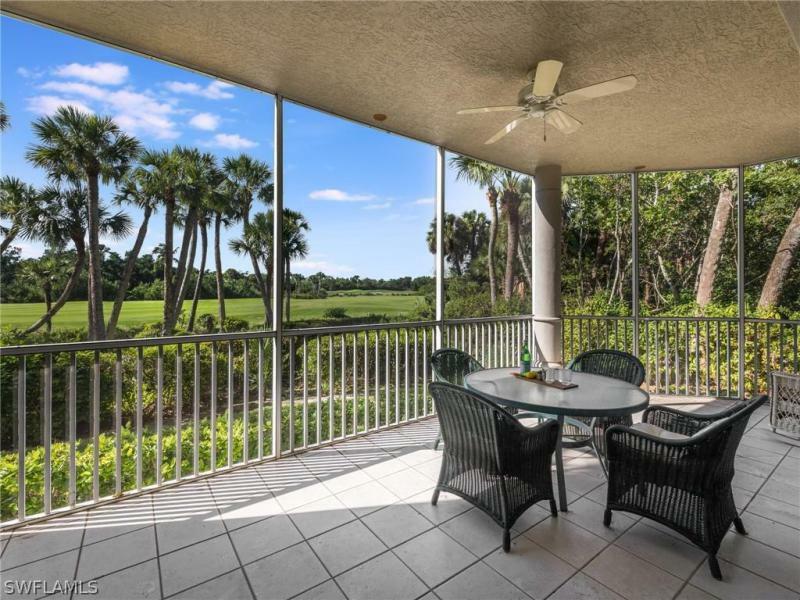 The garden style apartment has an open floor plan with panoramic views of the manicured fairways and tropically vegetated grounds of the golf course. Features include pella windows, 10-foot ceilings with crown molding and accent treys, new wood floors throughout, spacious master bath with dual vanities and jetted tub, private entry vestibule, durable concrete construction, and private enclosed garage located closest to this unit. Heron iii has one of the most private pools of all the heron condos because only six units share their pool. Heron iii is located in the larger community of sanctuary at wulfert point, which is a highly esteemed luxury development on the west end of sanibel for those who wish to join the sanctuary golf and country club, this unit is fortunate enough to have this world-class facility just beyond their doorstep, offering an arthur hills designed golf course as well as fine dining, and a state-of-the-art wellness center with health spa, fitness facility, pool, tennis, and pickleball. H. 13817 - off of west gulf drive, this close to the beach, 3/2 home offers beautiful open southerly views of the lake & tropical vegetation. The bright & open family room has high vaulted ceilings & a wall of bookshelves. Kitchen has all new stainless steel appliances, and overlooks the raised solar heated pool with large screened lanai and panoramic views of the lake. You walk directly out of the living area to the pool and patio with additional outdoor dining! Storm protection is offered with fabric storm panels and lexan shutters. Lovingly cared for and a wonderful family home to 3 generations, this floor plan has split bedrooms, roomy garage, separate laundry/storage room, 2 guest bedrooms and bathroom on east side and master bedroom & bathroom on west side. Amenities include tennis courts & deeded beach access directly t to the gulf of mexico! Also, a great opportunity for an investment home with excellent rental potential! Offered furnished with some exceptions.